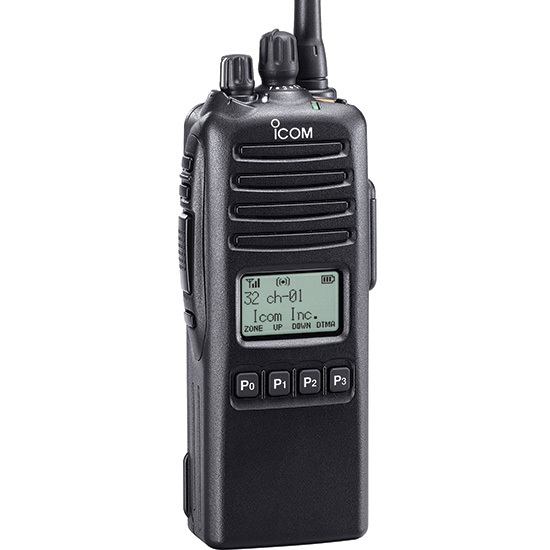 The 2-Tone, 5-Tone, CTCSS, DTCS and MDC signaling capabilities are built-in for group communication or selective calling. Up to 10 2-Tone and 8 5-Tone codes can be decoded on a single memory channel. This is perfect for professionals who require multiple district paging on one channel. When a matched tone is received, the following items are programmable for each code. The large high contrast LCD clearly shows a variety of information with a full dot-matrix display. Program the display to show either 1 line with 12 characters or 2 lines with 24 characters. Status icons are displayed at the top and the functions assigned to the P buttons (P0P3) are shown at the bottom of the display. The F80DS includes FIPS 140-2 validation, which confirms that the Icom encryption module, Icom AES Encryption, has passed rigorous field tests and provides agencies the independent assurance that the module meets or exceeds the highest performance standards in encryption for its classification. FIPS encryption is a requirement for many federal agencies.